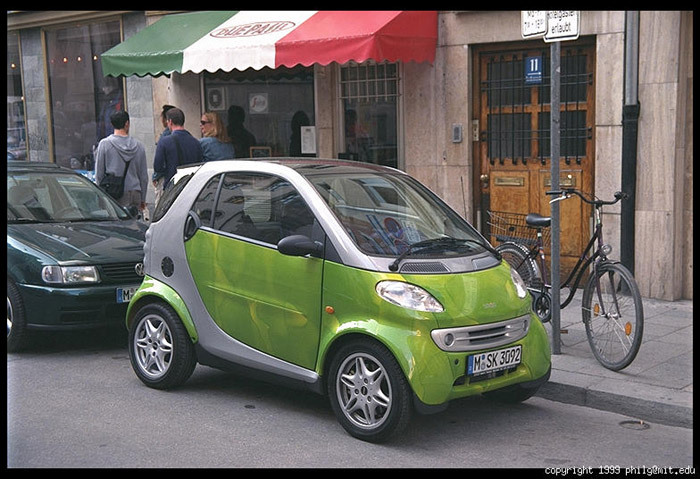 See the 2008 Smart ForTwo, an update to this older 2003 design. 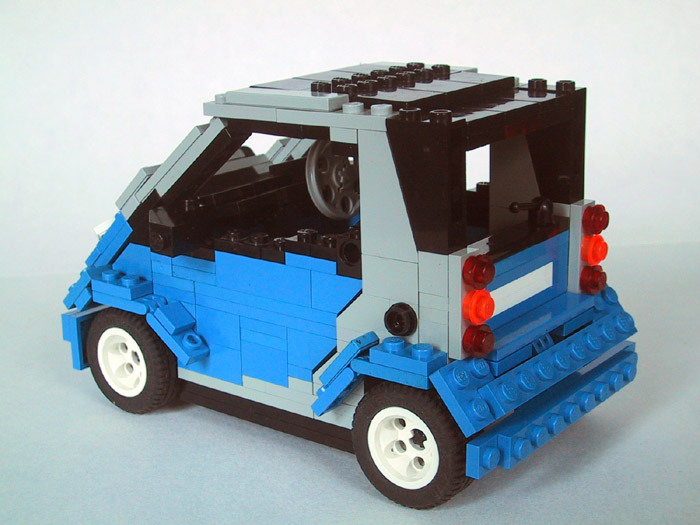 I have always loved the way the Smart cars look, and I thought it would be an interesting challenge to try and build one. 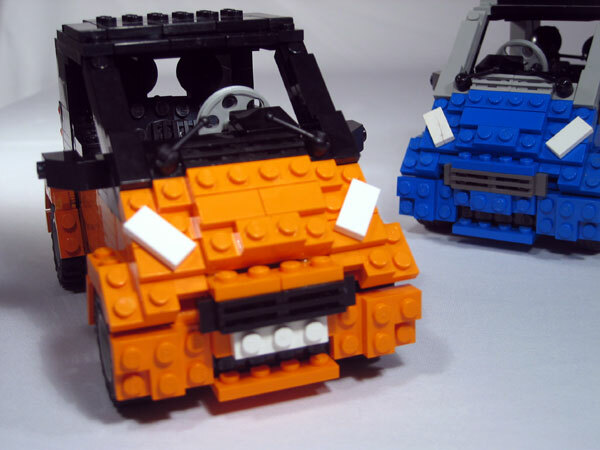 The completed model is 10-studs wide and 17 studs long, matching the real car's 1.5 x 2.5 meter measurements. 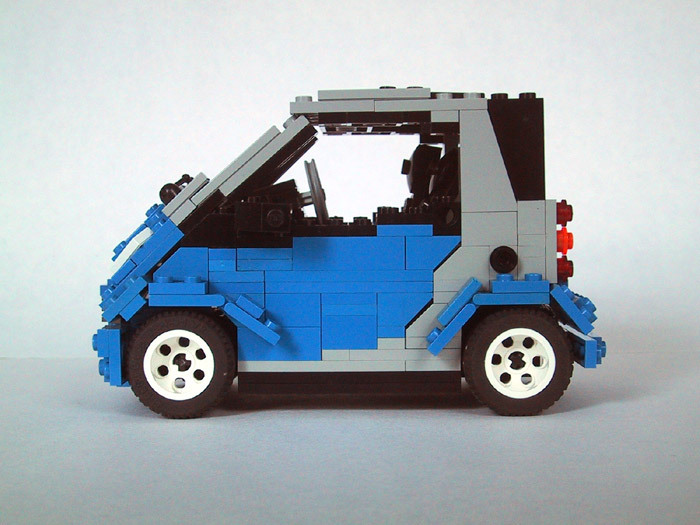 The blue and grey Smart was built in 2003. 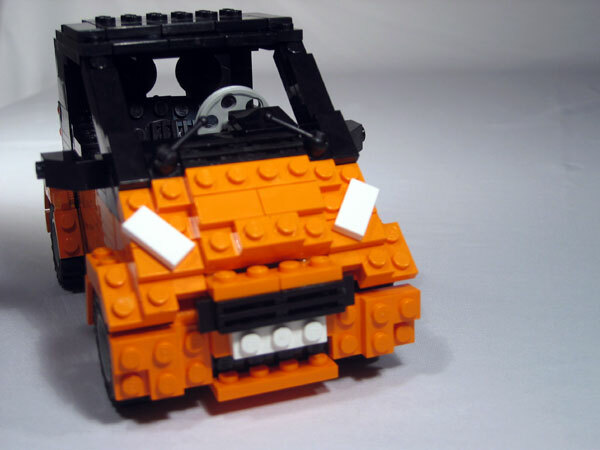 In December 2004, I was commissioned by a gentleman in the UK and built the orange and black car. The client wanted me to reproduce his girlfriend's car; he gave it to her as a Christmas present. 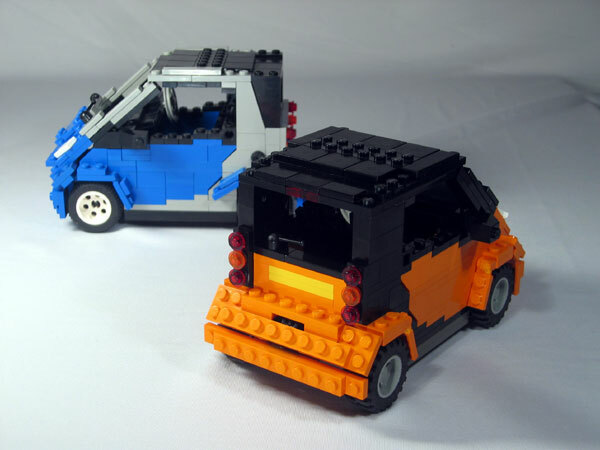 The orange-and-black car was built as a duplicate of the client's girlfriend's car. He took photos of her car so that I could get every detail correct, from the rear license plate (which is yellow), to the grey wheels, and other specific accent colors. 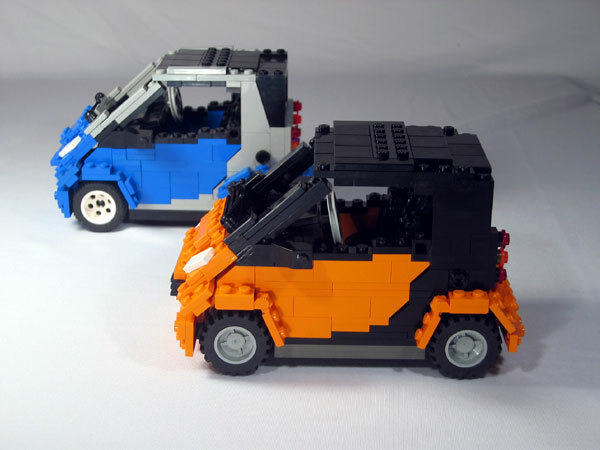 The orange car, by request, is left-hand-drive. (Odd, though, since the client lives in the UK.) 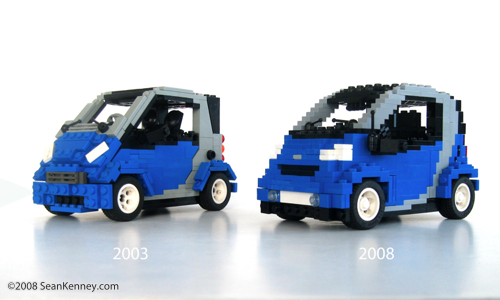 The blue car, my original, is right-hand-drive. 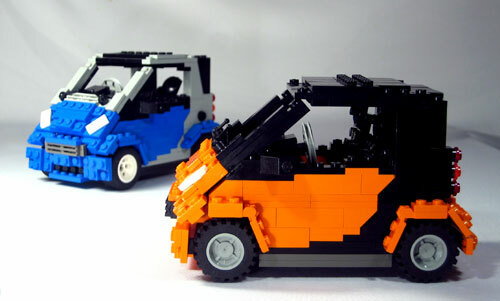 The orange car was easier to build than the blue one because it is only two colors, instead of 3. 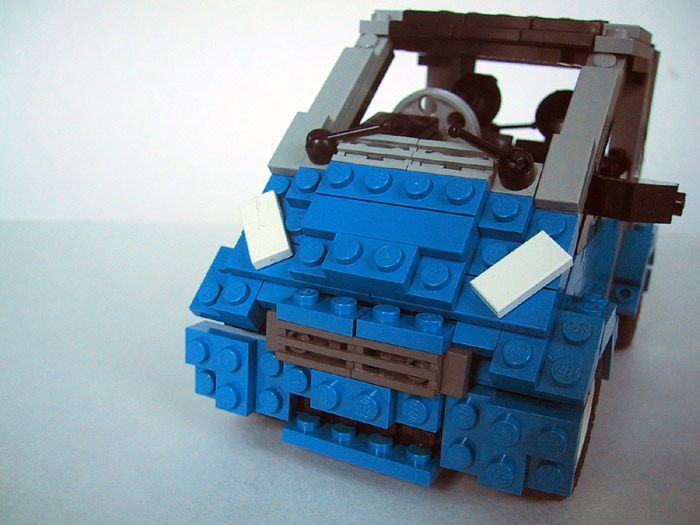 The blue car has a lot of areas with thin black trim; this results in a lot more smaller pieces, and an overall more complicated construction. I'm particularly happy with the design I used for the tail lights... It fits just perfectly and really helps give the car some of it's signiature personality. This view shows a slight bulge in the hood, as well as the grey "swish" shape unique to the Smart. I also realized after I took all these photos that the front fender is hinged askew. Doh! I had made several versions of the front skirt; It was tough trying to illustrate the curvature of the nose and the bulge of the front fenders while still getting in the air scoop on the bottom. I added a front license plate to the second model, since it wasn't present on the blue one. I like the way it turned out, even though it should probably be a little wider. The grille was tricky because it is curved in real life. 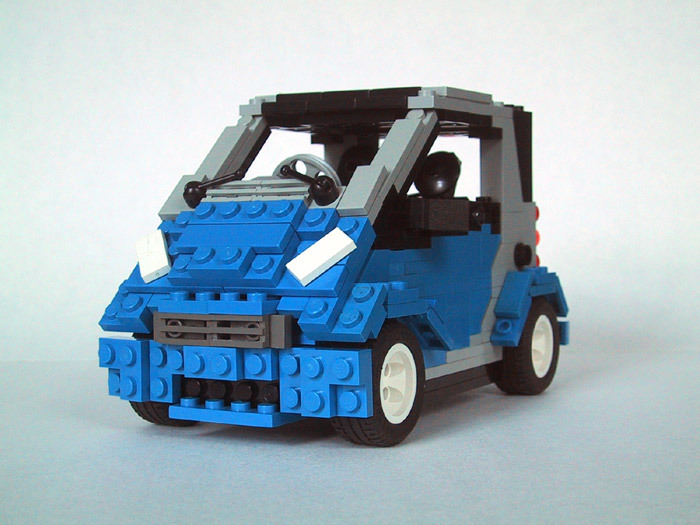 I simulated this with half-stud offsets just behind it, to make it look like it curves off toward the fenders.